The effect of acute and chronic cold exposure on heart rate (HR) and neuronal function in crayfish Procambarus clarkii and prawns Macrobrachium rosenbergii was addressed. This is particularly important since prawn farms of this species are used for aquaculture in varied climates world wide. The success of P. clarkii as an invasive species throughout the world may in part be due to their ability to acclimate to cold and warm habitats. A set of experiments was devised to address the physiological abilities of these species in managing rapid changes to cold environments as well as their ability to respond to sensory stimuli by using behavior and a bioindex of HR. Prawns died within 2 hrs when moved from 21˚C to 5˚C. Crayfish reduced their HR but survived for at least a week with this rapid change. Changes in temperature of 5˚C each week resulted in death of the prawns when 10˚C was reached. Some died at 16˚C and some lasted at 10˚C for 1 day before dying. Crayfish remained responsive to sensory stimuli and survived with either rapid or slow changes in temperature from 21˚C to 5˚C. Primary sensory neurons were rapidly inhibited in prawns with an acute change to 5˚C, where as in crayfish the activity was reduced but not completely inhibited. An induced sensory-CNS-motor circuit elicited activity at neuromuscular junctions in prawns and crayfish at 21˚C but with acute changes to 5˚C only in crayfish was the circuit functionally intact. The ability to survive rapid environmental temperature changes will impact survival and in time the distribution of a species. The significance of these findings is that they may account, in part, for the wide ecological distribution of P. clarkii as compared to M. rosenbergii. The invasiveness of organisms, as for P. clarkii, is likely linked to the physiological robustness to acute and chronic temperature changes of habitats. Animals that are conformers to the environment, such as many invertebrates, face physiological and behavioral tasks to survive in extreme environments. The ability of the crayfish Procambarus clarkii and the prawn Macrobrachium rosenbergii to acclimate to rapid and gradual exposure of cold environments was addressed in this study. Both species have economic and ecological concerns such that they are both used for human food consumption in places outside their native habitats. The increased interest in aquaculture farms for M. rosenbergii has resulted in a distribution outside of Malaysia to numerous locations. The desire to rear crustacean species for food sources in different environments comes at a cost in managing the environment in which the animals are raised. An outdoor or a regulated environment for rearing these animals drives the economic feasibility of growing them as a food source. In addition, the temperature for transportation is of concern when there is a strong susceptibility to rapid temperature changes. International transportation may result in the animals being inadvertently or intentionally intermixed with native species leading to dispersion into new ecological niches. The aggressive invasion of P. clarkii within North America and introduction into Europe and Asia has already produced ecological and economic concerns . Part of the concern is that P. clarkii was a source responsible for the plague of the European native crayfish [2,3]. To understand the potential threat of invasive species, the physiological ability of an organism to survive in novel environments with associated seasonal changes can be addressed in defined laboratory conditions. In this study we address the physiological effects on these species with cooling at various rates from 21˚C to 5˚C. This study is original in that behavior and physiological parameters (heart rate, primary sensory neuron activity, and a neural sensory to motor circuit) were addressed to account for survival differences between two crustacean species in a laboratory setting. An extreme physiological failure from cooling is death and can be used from laboratory experiments as a predictor of survival in nature. The death maybe due to the failure to thrive of the animal on its own status as well as within a natural arena, with predators lurking, where survival would not likely occur for an animal with an inability to escape or defend itself due to physiological breakdown. Response to threatening sensory stimuli, within defined laboratory conditions, can be used as an indication in the likelihood of survival in an ecological arena. We used a tap on the telson to mimic a threatening stimulus [4-6] and then observed the animal’s behavior. The animals which did not exhibit a behavioral response to a tail tap would not necessarily imply a lack in the ability to sense the stimulus. Changes in heart rate (HR) appear to be a good index for subtle sensory cues in crayfish even when there is no observable behavior change [7-9]. This might be due to the heart being neurogenic. It is known that crayfish can choose to avoid some temperatures when they have a choice [10,11]. This implies that crayfish, and possible crustaceans in general, can detect temperature, either directly through thermal sensory reception or from changes in physiological conditions due to temperature changes. It is well established that temperature alters cardiac and circulatory performance in crustaceans [12-15] and neural activity within the CNS and motor neurons [16,17]. Such internal changes in physiology may drive the behavioral alterations. In order to address if crayfish and prawns might not elicit an observable behavioral response due to the inability to sense a stimuli within cold environments (10˚C to 5˚C), we chose to use HR as a bioindex of the animals’ intrinsic status  as well as direct recordings from sensory nerves. In excised preparations of the abdomen, the responses of sensory, CNS, motor nerves and muscle responses to a given sensory stimulation on the cuticle were used to determine where, if any, alteration occurs in a sensory-to-muscle unit. Any change in the relay of the signal may potentially account for the lethargic and non-responsive nature of the animals when exposed to acute cold temperatures (5˚C). Gradual seasonal changes in temperature allow organisms to acclimate to the harsher mid-seasonal winter or summer; however, an abrupt seasonal change can be lethal . We simulated both conditions within the laboratory with weekly changes of 5˚C and an acute change from 21˚C to 5˚C, while monitoring survival, behavior and HR as well as an alteration in HR due to a sensory stimulus. The novelty in this study is demonstrating the stark differences in the responses to acute and chronic cold stress between the P. clarkii and the M. rosenbergii that may well account for the natural distribution and invasiveness between these species. The housing of the prawns requires some care as they are more sensitive to hypoxic and thermal stress as compared to the crayfish. In this study, the behavioral assay of responsiveness to a tap of the tail was generalized to note if the animal moved or not. The electrical recordings of heart rate and neural responses were used as measures of physiological responsiveness to the acute and chronic effects of the temperature change. Procambarus clarkii, measuring 6 - 10 cm in body length (Atchafalaya Biological Supply Co., Raceland, LA) were used. Crayfish were housed individually in an aquatic facility. Macrobrachium rosenbergii 12 - 19 cm were obtained from an aqua-culture facility at Kentucky State University, Frankfort, KY. They were housed in a University of Kentucky laboratory at 20˚C - 21˚C for 3 weeks prior to experimentation. Both crayfish and prawn were fed commercial fish food pellets (Aquadine), which is marketed as “shrimp and plankton sticks: sinking mini sticks”. The chloramine of local water was removed by carbon-based filters for the aquaria water. Bacteria and algae were allowed to grow in the holding tanks to help detoxify any ammonium ions [20,21]. The water was aerated for several days before use and the holding tanks for prawns were continuously aerated as they are more susceptible to hypoxia than crayfish. During acute and chronic changes in water temperature, the water was continually aerated for both the crayfish and prawns. The same procedures were used, as described in an earlier study with crayfish, for obtaining heart rates [8,18,22]. No modifications were required in the procedure for the larger prawns. In brief, two insulated iridium/platinum wires (diameter 0.005 inches and with the coating 0.008 inches; A-M systems, Inc., Carlsburg, WA) were placed under the dorsal carapace directly over the heart to record the HR. Wires were inserted through holes drilled in the carapace and cemented in place with cyanoacrylate ester and accelerator (HobbyTown USA, Lexington, KY). The placement of the recording leads is shown in Figure 1(A). The use of this rapid drying glue reduced handling stress of the animals which is known to have an effect on HR [8,23]. All the recording experiments were conducted 2 to 3 days after the initial wiring of the animals. Impedance detectors (UFI, model 2991) were used. These signals were recorded on-line to a computer. The HR was determined by direct measures with a window discriminator which measured a running average of instantaneous events. The values were then converted to beats per minute (BPM). In the acute experiments, the water in the holding tank was rapidly changed (within 2 minutes) while heart rate recordings were being made. After several minutes a stimulus was applied by hitting the telson with a glass rod . The environmental temperature was then dropped and responsiveness to stimuli was repeated at each temperature setting. In monitoring HR with changes in temperature chronically, baseline recordings were obtained at 20˚C - 21˚C and responsiveness to stimuli. For 7 days animals were held at a given temperature within a regulated incubator (lights 12:12 h on and off). After 3 days the animals were tested for alterations in HR when their telson was tapped. Then after 4 more days (7 days from the start) baseline recordings were obtained and then the water was changed to the next lower temperature while continuously recording HR. The incubator was also adjusted to maintain the water temperature in the animal chambers. The survival of the animals was noted in the acute and chronic studies. Death was determined by an absence of a HR and completely flaccid body parts. Animals were placed back in the chambers at room temperature for observation for the potential of recovery. This was an important assay to predicting survival in nature to temperature changes. All experiments were carried out in a modified Van Harreveld’s solution (205 mM NaCl; 5.3 mM KCl; 13.5 mM CaCl2·2H2O; 2.45 mM MgCl2·6H2O; 0.5 mM HEPES adjusted to pH 7.4) . The animals were sacrificed in less than 5 seconds by rapid decapitation followed by removal of the abdomen. As detailed in Strawn et al.,  and provided in video format , the abdomen was separated from the thorax by cutting through the carapace between the thorax and abdomen. The ventral nerve cord (VNC) was transected between T5 and A1. The abdomen was then pinned ventral side up in a Sylgard lined dish. Exposure of the VNC with the nerve roots and superficial flexor muscle entailed cutting along the midline of the ventral articular membrane (anterior to posterior) and then along the rib laterally from the midline. This section of articulating membrane was then reflected rostrally and removed so as to expose the superficial flexors, VNC and segmental ganglia to the bath solution. 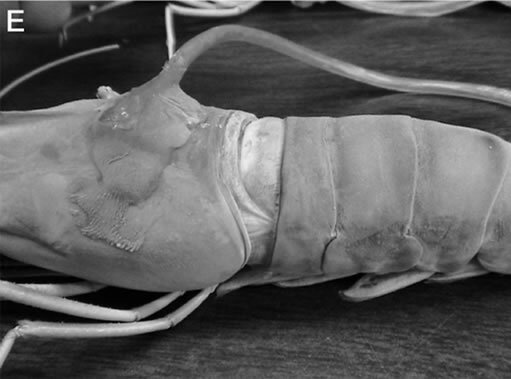 Recordings of the 1st and 2nd primary sensory roots to the 3rd ganglion were used to access sensory neuronal function with rapid exposure to cold saline (5˚C) in the prawn and crayfish before and during cuticular stimulation. The 1st and 2nd roots were transected on one side of the ganglion and both nerve roots were pulled into a suction electrode. A schematic of the dissected segment and brush stimulation is shown in Figure 2. For cuticular stimulations, a wooden dowel lined with several toothbrush bristles was placed on a micromanipulator which was positioned along the lateral side of the third abdominal segment. The manipulator was then moved back and forth for a set distance of 1 cm along the cuticle of the segment in which the nerve root was being monitored. The electrical signals were obtained and amplified with a P-15 (Grass Instruments) amplifier and captured on a computer with a PowerLab/4SP interface (AD Instruments). A different set of crayfish were used for recording the CNS output to motor neurons. The motor neuron activity was measured by the synaptic responses on the superficial flexor muscle on the 3rd segment. The same dissection technique was used as for recording the sensory roots, described above, but the ganglion roots and cuticular rib were not cut. The ventral articular membrane was pulled back to expose the muscle fibers. Intracellular recordings were performed with a microelectrode (3 M KCL, 20 - 30 MOhm) inserted into a medial muscle fibers. The amplitudes of the excitatory postsynaptic potentials elicited by the motor nerve were monitored. Intracellular responses were recorded with a 1× LU head stage and an Axoclamp 2A amplifier (Molecular Devices, Sunnyvale, CA, USA). To evoke a sensory-CNS-motor circuit, the cuticle on the side of the segment was stimulated by brushing as for inducing sensory nerve activity . Figure 1. (A) Schematic representation for the placement of the recording leads for monitoring the heart rate. On the dorsal carapace, two leads smaller arrows, span the rostral-caudal axis of the heart to monitor heart rate; (B) Depicts the dorsal view of the crayfish directly over the heart; (C) With the dorsal cuticle removed and the heart slight stained with methylene blue, for contrast, one can see the heart is close to the cuticle. So as not to impale the heart a short (1 - 2 mm) length of wire only needs to penetrate the cuticle; (D) and (E) show the protective tube, with leads inside, is glued to the carapace for a crayfish and prawn respectively. and continued while the bath was rapidly exchanged to a 4˚C - 5˚C saline. The sensory stimulation was repeated in the same manner for comparison in neural activity due to acute cold exposure. Cuticular stimulation was repeated 5 times and the average percent change in frequency was used as an index for the effect of stimulation. The average activity at 21˚C to 5˚C was measured and a percent change reported. Nonparametric analysis (Wilcoxon rank-sum nonparametric test) in the direction of change of HR and neural activity within each individual was used. The ability of the animals to survive, show a tail flip, perform a behavioral alteration to a tap on the telson, and note a disturbance in heart rate for the various environmental conditions was noted. In six out of six cases, placing prawns from a 21˚C environment to a 5˚C resulted in death within 2 h (p < 0.05, nonparametric). However, six out of six crayfish survived over the same 2 hours exposure and upon placing them back to a 21˚C environment, demonstrated normal behavior within 1 hour. In animals that were monitored for HR at the various temperatures, the responses in the HR recordings to tail taps were marked on the data collection files. The wave forms obtained for the HR can vary depending on placements and amplification by the impedance measures. A representative trace of HR for analysis is shown in Figure 3(a). 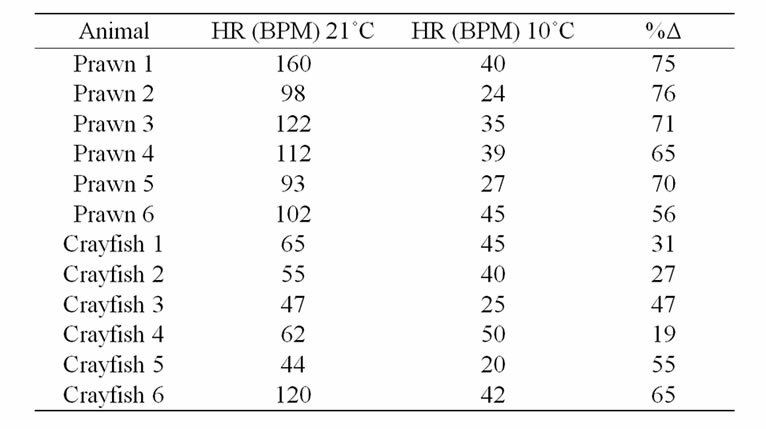 In this particular response of a prawn, the HR at 21˚C was 84 beats per min (BPM). The waveform shapes and not just rate can change over time at a give temperature. In Figure 3(b) a crayfish at 21˚C is tapped which results in cessation of HR for about ¼ second before the rate increases again. Also, after some time in the colder temperatures the waveform shapes can become varied as compared to the wave forms at 21˚C as for the case in Figure 3(c) after being at 10˚C for 30 min. Sometimes the HR may first slow down and then will increase upon an initial shock of colder temperature just in the case of a physical disturbance (Figure 4). Such biphasic responses have also been noted in earlier studies for HR as well as ventilatory rate (VR) [7,8,28,29] for environmental disturbances when animals were held at 21˚C. The HR wave forms can also become erratic upon switching acutely from 21˚C to 10˚C or to 5˚C but then they generally stabilize after a few minutes. With a rapid change from 21˚C to 10˚C a common occurrence is a drastic drop in HR followed by a rise for both crayfish and prawns. The drop observed for a telson touch or an environmental disturbance usually did not last as long (few seconds) in warmer environments as compared to the changes with a cold shock (few minutes) (Figure 4). The responsiveness to a telson touch was assessed for both the acute and chronic environmental conditions in both species. In the cold environment the changes in HR maybe be small and are easily missed when averaging over long periods. If changes are examined from instantaneous beat to beat then the changes are more obvious (Figure 4, see response noted after telson tap Figure 3(b)). Such consideration in the responses was noted for analysis in alterations in HR. Figure 2. A sensory-CNS-motor preparation used to monitor aspects of the neural circuit. A brush is used to stimulate the sensory structures on the lateral side while monitoring either the primary sensory or motor nerve roots or the EPSPs produced at the neuromuscular junction (Modified from ). Figure 3. Representative wave forms of heart rate (HR) in different conditions. 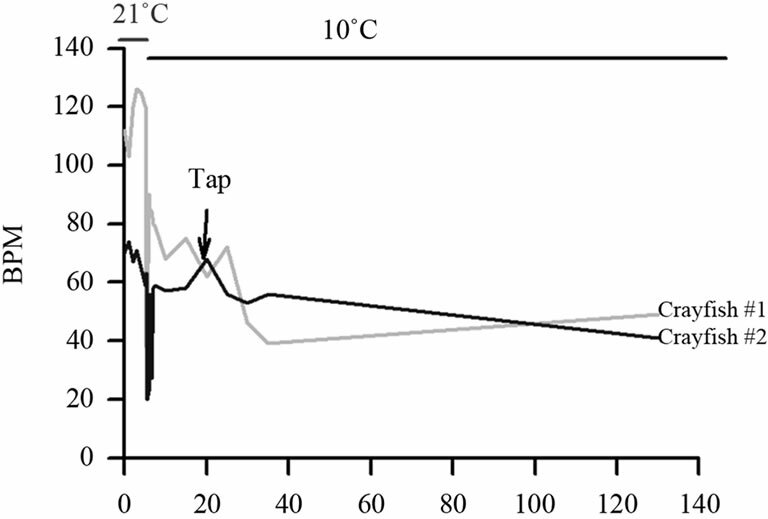 (a) Prawn at 21˚C; (b) Crayfish at 21˚C and tapped on telson. A short stop in the HR is observed; (c) The same crayfish as used in (b) is placed at 10˚C for 30 min. Note the striking difference in the waveform measured. All traces are of 2 sec period. whereas 6 out of 6 crayfish responded to the same stimulus (Table 1). The prawns were paralyzed in about 20 minutes and after an hour were on their side completely flaccid. After placing them back in water at 21˚C they did not recover. The percent change in the reduction of HR is greater for the prawns than for crayfish, as the difference in the median values between the two groups is greater than would be expected by chance (p = 0.004; Mann-Whitney Rank Sum). All the crayfish recovered from the acute changes in temperature. The rapid decrease in HR paralleled the immobility of the prawns; however, crayfish would still move away from a stimulus and beat their swimmerets in the low temperature. The larger drop in HR for the prawns may also be due to the fact that they generally had a higher resting HR than the crayfish. The prawns are more easily agitated than crayfish, as they often try to swim or tail flip more while in the holding tanks as compared to the crayfish. 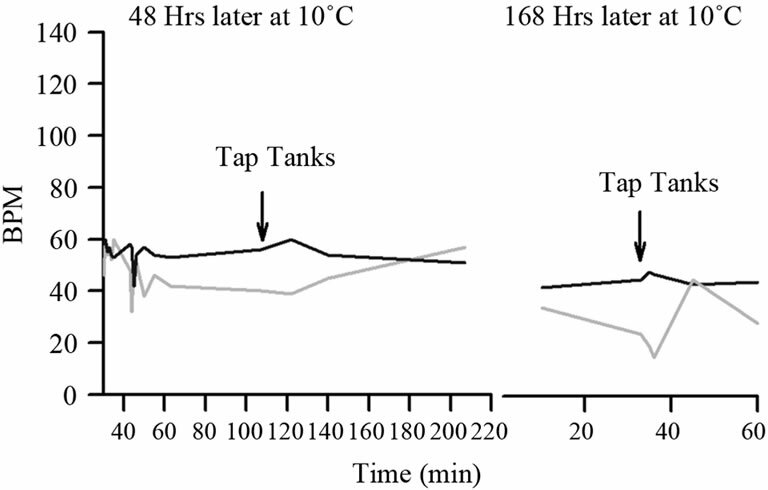 With the acute change in temperature to 10˚C and remaining at 10˚C for days, crayfish continued to show a responsive HR to a telson tap or to tapping on the sides of the holding tank (Figure 5). This response was still observed up to 7 days. Table 1. The effect on HR from an acute change in temperature. The HR was obtained after 20 minutes being held at 10˚C. Rates are recorded as beats per minute (BPM). Figure 4. Crayfish show alterations in HR to a telson tap after an acute temperature change. Also note the reduction in HR with the temperature change prior to the stimulation. Since the prawns could not survive and became unresponsive to rapid changes in temperature, we then proceeded to address if the prawns would withstand a gradual drop in the water temperature to 10˚C or 5˚C over several days. 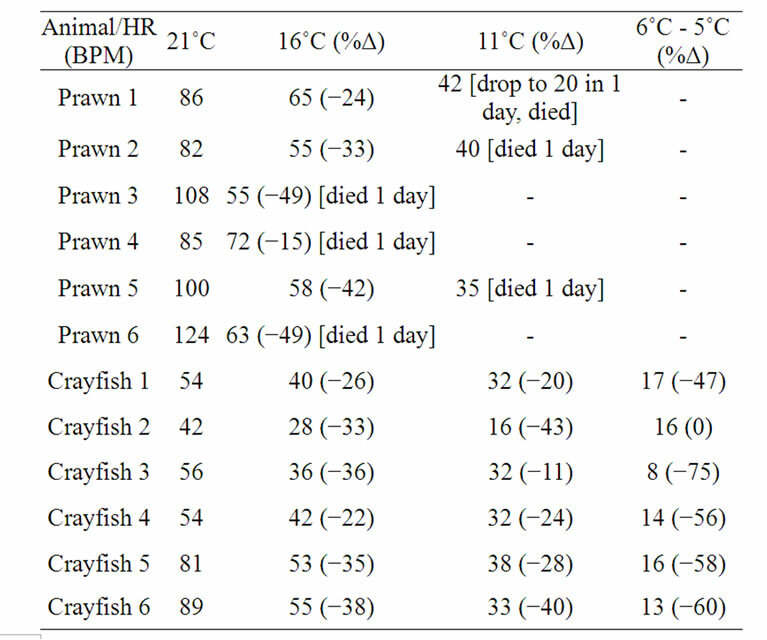 With increments in reduction of temperature by 5˚C, from 21˚C to 16˚C, for a week of conditioning before the next temperature drop, the HR of both crayfish and prawns continued to decrease by the end of the 7 day of conditioning (Table 2; p < 0.05, Wilcoxon rank-sum nonparametric test). A percent change is shown for ease in comparison along with the raw HR values as each animal started with a different basal rate at 21˚C. The prawns started to die at the 16˚C and if they lasted 7 days they died shortly after being exposed to 11˚C. All the crayfish survived the temperature changes down to 6˚C or 5˚C, although their HR was substantially lower than the preceding week at a higher temperature (p < 0.05, Wilcoxon rank-sum nonparametric test). Also, the greatest percent change for the crayfish occurred in the last week when dropping from 11˚C to the 6˚C or 5˚C level. The crayfish held at 5˚C would move their legs if disturbed but in a notably slower motion. They would not tail flip after a week at this temperature but would slowly move when disturbed by a tap on the telson. A gradual decrease in HR is seen each week in the plot for three representative crayfish (Figure 6). In one instance, a single crayfish was used from the chronic paradigm and the temperature decreased to 0˚C with ice forming around a crayfish. In this isolated case, the HR was still able to be measured. Upon gradual warming of the tank to 21˚C, the animal showed a full recovery and responsiveness to visual and tactile stimuli. Table 2. Heart rate values at each week of being at a given temperature. Percent change in rate provided as the temperature was dropped from the week preceding. The change in HR for a 10˚C temperature shift is measured as a Q10 index. This was calculated by Q10 = rate/ (rate-rate at 10˚C less). In reality it was 10˚C to 11˚C degree change when estimating Q10 from 16˚C to 6˚C or 5˚C, as the environmental chamber fluctuates from 6˚C to 5˚C at this setting. The Q10 values were determined for animals that were not on the verge of death, but still responsive. 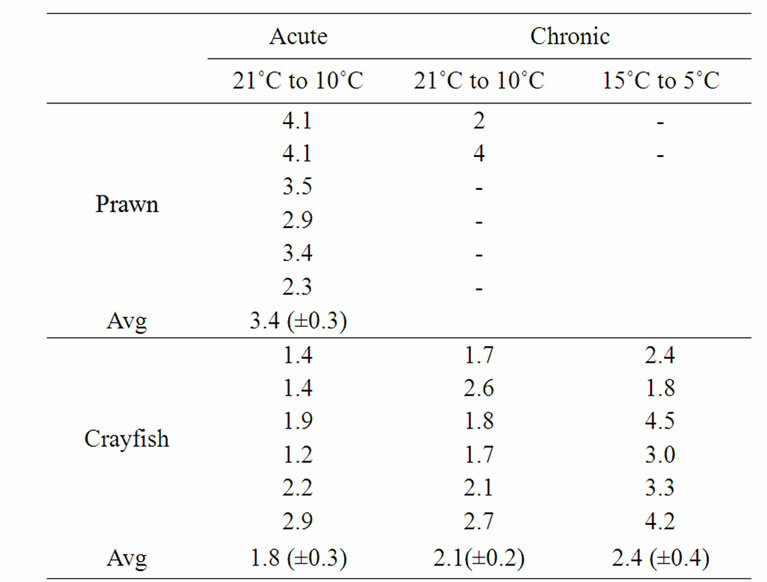 There were only two prawns that survived to 11˚C for 1 day at this temperature in the chronic study; so, the Q10 value is not reliable but included for comparative purposes. Table 3 summarizes the Q10 for acute and chronic studies in both prawns and crayfish. Figure 5. The same two crayfish shown in Figure 4 but after longer periods in the cold environment and then stimulated. Table 3. Q10 values for HR while environmental temperature was altered from 21˚C to 10˚C and 15˚C to 5˚C experimental paradigms. The chronic conditions were gradual changes sequentially at 5˚C increments over 7 days. the same temperature change. Also there is no difference for the Q10 values for the 21˚C to 10˚C compared to the 15˚C to 5˚C for the crayfish. Since both the crayfish and prawns exposed to cold temperature reduced their behavioral responsiveness to touch and other environmental stimuli, we sought to address if primary sensory and motor nerve responses were dampened to a defined stimuli. A defined sensory stimulus on the cuticle was given while recording either from the 1st and 2nd transected roots with a suction electrode. In the case of monitoring motor nerve activity, responses were measured by the occurrences in EPSPs in superficial flexor muscles with an intracellular electrode during the cuticular stimulation. With intracellular recordings the effect of temperature on synaptic responses at the NMJ could also be examined. Different animals were used for sensory and motor unit activity measures. 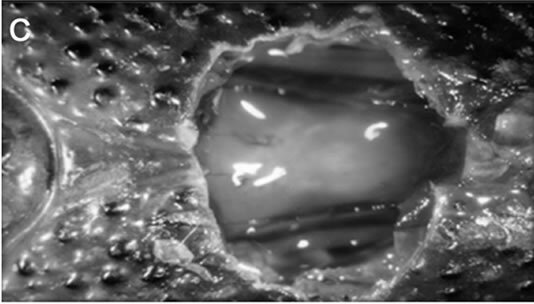 The exposed abdominal preparations were dissected in 21˚C and examined for responses to the cuticular brush stimulation for 5 trials followed by a rapid bath exchange to 5˚C and retested with the brush stimulation for another 5 trials. In some cases, the preparation was reexamined when the bathing media was replaced back to 21˚C. For crayfish, the initial drop in temperature would result in unresponsiveness of the sensory nerves for about a minute. After allowing the preparation to remain in the cold saline for 5 minutes the response would return albeit with a reduced activity profile for the same stimulus (Figure 7). However, for the prawns the sensory nerve remained quiescent after being exposed to the low temperature (Figure 7, right panel). Since the absolute number of extracellular spikes varied from preparation to preparation, a percent change in activity is reported in Table 4. To calculate a percent change, the frequency measured during the stimulation period at 21˚C was compared to that at 5˚C. The percent change for the prawns is 100% since in 5 out of 5 preparations there was no sensory activity 5˚C. The motor neuron activity was indexed for each preparation by the average frequency of the EPSPs during the sensory stimulation over 5 trials. The average response for each preparation at 21˚C is compared to the average at 5˚C. The stimulus trails were repeated 5 times just as for sensory nerve recordings. 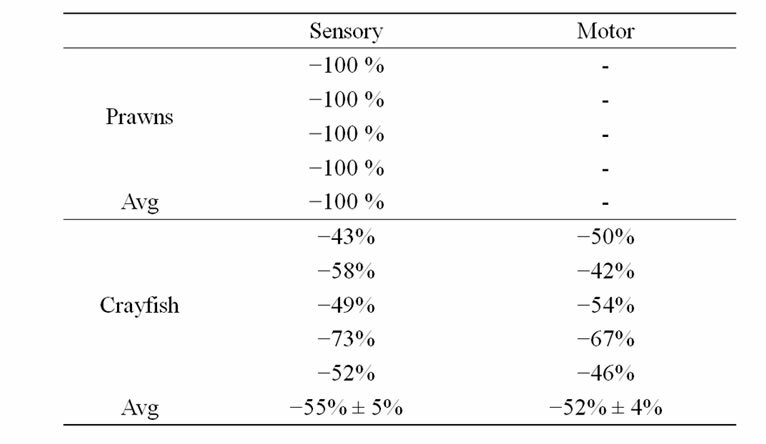 A percent change was determined in the same manner as described above for the sensory nerve in order to allow for comparisons among preparations in motor nerve activity (Table 4). The crayfish preparations remained active in the motor drive even in the cold exposure although responsiveness was reduced. In one of the five crayfish preparations the activity was actually enhanced for a few stimulus trials in the cold but then decreased for the remaining trails. Also interesting is the reduced background occurrence of EPSPs during the cold exposure. In addition, after a sensory stimulation a rapid reduction in activity occurs following the stimulus while being exposed to the cold (Figure 8; n = 5, p < 0.05, Wilcoxon rank-sum nonparametric test). The synaptic responses at the NMJs for the prawns were not consistent. Resting membrane potentials in the muscle fibers were robust (–50 to –60 mV). However, the sensory drive to activate motor nerve responses could not be maintained even at 21˚C for the 5 trails. Therefore, the effect of lower temperature could not be assessed for the neural circuit for the prawns. Since the sensory activity quickly failed, it is not surprising that the motor neurons would not be driven by sensory activity during the cold exposure. The frequency of EPSPs, from the sensory driven stimulus, was dampened during cold saline exposure. A representative example shown in Figure 8 illustrates this point. Figure 7. 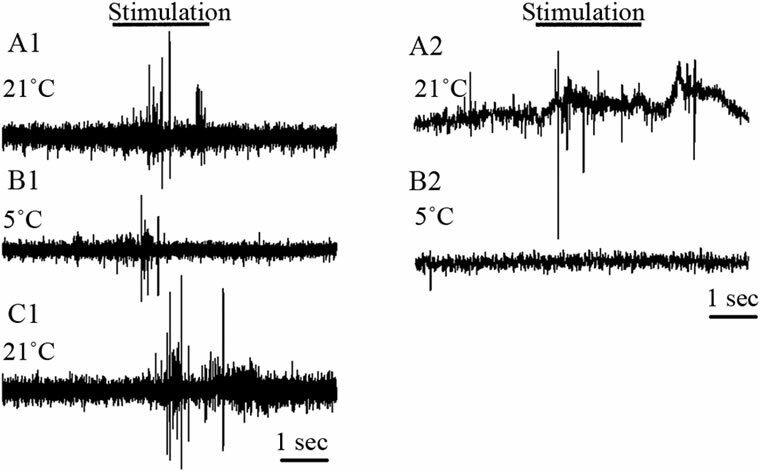 Activity from the 2nd root of abdominal segment 3 before and during cuticular stimulation with a course brush while exposed to various temperatures. A1, B1 and C1 for crayfish and A2 and B2 for a prawn. After a single exposure to 5˚C most of the time the nerve would not recovery upon re-exposure to 21˚C. 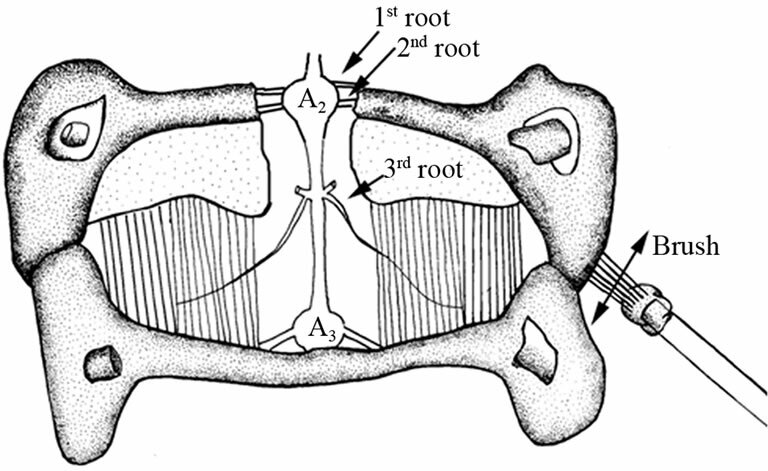 The second root is transected from the ventral nerve cord; thus only primary sensory neural activity is being recorded. Table 4. Percent change in frequency of neural activity with a drop in temperature from 21˚C to 5˚C. Figure 8. 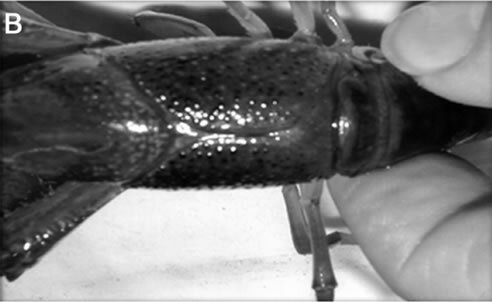 EPSP responses in the superficial flexor muscle at 21˚C and then acute exposure to 5˚C for a crayfish while stimulating the cuticle with a course brush. A burst of activity occurs with the stimulation. At 5˚C the burst in EPSPs is dampened as compared to 21˚C exposure. The enlarged insets, where the arrows demark the trace, illustrate the reduced frequency in activity of the individual EPSPs. Activity was diminished and in all cases (5 out 5 preparations). The EPSP would stop occurring after 10 to 20 seconds after the sensory stimulation was stopped. The enlarged insets of the EPSPs illustrate the reduced activity as the EPSPs are not summating because the frequency of occurrences is reduced at the lower temperature. This study demonstrated that the crayfish species Procambarus clarkii is very resilient to surviving acute as well as chronic exposure to cold environments as compared to the prawn species Macrobrachium rosenbergii. The crayfish were able to behaviorally respond to potential threatening stimuli (tail tap) even while exposed to a cold environment. The behavioral responses correlated well to physiological measures in HR and neural activity. However, the prawns did not respond well behaviorally to sensory stimuli while exposed to the cold. This lack in responsiveness is likely accounted for in a decrease in the ability for sensory neurons to relay the signal to the CNS as the activity of sensory neurons was drastically reduced upon cold exposure. In addition, the HR plummeted upon exposure to cold as compared to the crayfish for the same decreases in temperature exposure. We propose from the results of this study that the ability of the P. clarkii to survive rapid as well as chronic exposures to cold probably accounts for its wide geographical distribution as compared to M. rosenbergii which is only found in the wild in temperate environments with warm water. The quiescence of sensory and motor nerve activity at 5˚C for M. rosenbergii not only accounts for the lack of responding to a tail tap or cuticular stimulation but also likely is the reasoning for silencing of cardiac neurons that drives the neurogenic heart. Physiological compromise, as observed for M. rosenbergii during a cold exposure, would not allow the animal to defend itself from predation in a true ecological arena. The findings in this study are important for the aquaculture industry in maintance and shipping of these species as well as ecologists in having a physiological means to aid in mechanistically explaining geographical dispersion and invasiveness of varied species. The weekly acclimation studies, of relative small changes in 5˚C, did prolong survival for the prawns as compared to the rapid ~15˚C studies. With a high death rate at 15˚C and 10˚C as well as a 100% death by the time the 5˚C was reached after 3 weeks, it became apparent that even a week at each temperature drop was not adequate for the prawns to fully acclimate. The acute change of 15˚C produced a rapid death within about 2 hours for a 100% of the prawns. Potentially a more gradually temperature drop with a prolonged duration at each temperature would produce a different outcome. In a study of spider crabs, a tolerance of hypoxia induced by a decrease in ventilation rate and HR was key in limiting the animal’s survival . Potentially, prawns are more sensitive to the hypoxic state with decreased hemolymph circulation and ventilation of the gills. The ability of the crayfish to maintain behavioral responsiveness to mechanical stimuli illustrated that the sensory-CNS-motor system is functional even at 5˚C. Also, the noted alterations in HR, although reduced, at colder temperatures would suggest the crayfish can respond to environmental disturbances which could mimic a predator. The sensory responses, as measured by extracellular nerve recordings, also demonstrated functionality in touch of the cuticular surface. Since the firing rate in the motor nerve was present, one might assume the animal could respond in some fashion to various stimuli. Being able to respond to the various sensory stimuli and respond in meaningful physiological changes (increased HR and nerve activity) for acute and chronic cold conditions would likely give the species an advantage in various ecological environments and during rapid environmental changes of cold temperatures. It would be interesting to note if P. clarkii are able to still copulate and spawn in temperatures of 10˚C or lower . Species such as the prawns used in this study would not likely survive with changes in cold temperatures compared to this crayfish species. Thus, the prawns would not likely be as invasive to cold environments. This probably accounts for prawns having a more defined endemic range in habitat within warmer climates. Examining behavioral selection of the environments of different temperatures by a species used in this study would be of interest. Prawns may avoid the cold as compared to the crayfish. It is known that larvae of crabs alter behaviors depending on temperature. A particular larval crab species avoids a decent swim in colder water but upon warming the water the larvae are induced to swim to greater depths . Thus, the crab larvae have some ability to sense the temperature gradients to alter their behavior. It is known that crayfish do avoid some temperatures by choice [10,11]. Investigation of temperature sensitivity within a neural circuit in crayfish revealed an enhanced synaptic response from the lateral giant (LG) axon to a motor giant (MoG) during cold exposure . This particular circuit drives the flexor motor neurons responsible for a tail flip. This well described neural circuit was one of the first neural circuits to be broken down to identified neurons to account for a whole animal behavior [4,5,32]. The ability for this central part of a circuit to function in the cold would suggest the crayfish would have the ability to escape if exposed to a cold environment. This enhanced synaptic response appears to be primarily due to an increase in input resistance of the axons in the cold . This past study of the LG to MoG was performed in an isolated ventral nerve cord. However, observing the behavioral responses of crayfish to a tail tap in the various temperatures allows one to realize the crayfish are not more responsive but less responsive in the cold. Thus, aspects of the circuit maybe enhanced, such as the LG to MoG, but this does not account for the intact whole animal behavior. Potentially if the primary sensory responses are dampened, then the drive onto the LG or medial giant axons is reduced. Thus, the animal would be less likely to tail flip for a given stimulus. The decreased sensory responses measured in our study would suggest this is likely the cause for the reduced responsiveness of the crayfish to tail flip in colder environments. In addition, the decreased motor neuron activity induced by cuticular stimulation supports this view. Acclimated organisms to altered temperature environments either slowly or with short pre-exposures is well known to be advantageous to subsequent longer exposures in such environments. The altered expression of heat and cold shock associated proteins are common examples in the Arthropod cousins of crustaceans, the insects, for temperature conditioning [33-35]. Crayfish have been shown to demonstrate altered acclimation in motor neuron activity when pre-shocked treatments were provided. It was demonstrated in the same species of crayfish used in our study that a cold pre-shock of 2˚C for 2 h did not produce as great of a decrease in spontaneous motor nerve activity as compared to non-conditioned or heat pre-shock (36˚C for 2 h) animals when examined in a range from 12˚C to 18˚C . It was also shown in crayfish that calcium binding and calcium transport proteins do alter their expression levels in relation to temperature changes [36,37]. It remains to be examined, if these changes occur in sensory and motor neurons. Also, how an alteration in these calcium regulating proteins might influence synaptic transmission in relation to acclimation has yet to be investigated. However, the role of calcium transport and exchangers in synaptic transmission has been investigated for the crayfish and Drosophila NMJs [38,39] and for the Drosophila heart  at room temperature. The cellular properties that have been suggested to allow invertebrates to acclimate to cold environments focus mainly on a means to maintain membrane fluidity, by alteration in the phospholipid composition, as well as an alteration in the make up of the hemolymph to avoid freezing [41-45]. As for the mechanistic differences in the physiology and biochemistry between the crayfish and prawn species used in our study for acute survival in the cold or acclimating to cold there are many likely possibilities requiring further investigations. A Q10 around 2 to 3 has been noted for various biochemical processes [46,47] so it is not surprising the values are similar for HR reported in intact crayfish. Interestingly, the crayfish were still responsive to sensory stimuli that altered their heart rate when cold shocked acutely as well as after long term cold exposure. The responsiveness indicates that a sensory to cardio-acceleratory or a sensory to inhibition of the cardio-inhibitory command is active in a crayfish operating at 10˚C. The innervation to the heart has been explored so experiments are reasonable to record from the cardioregulatory nerves to address the neural drive to the heart and the affect of temperature from central control [9,48-51]. We speculate the saline developed for crayfish might not be optimal for the synapses within the CNS or maintenance of the synaptic communication at the NMJ for the prawn species used in this study; however, as far as we are aware there is no saline developed specifically for the prawn. Given that they are relatively similar freshwater inhabiting crustaceans we utilized the well establish crayfish saline for these studies [20,52]. Differential changes in the amino acid composition in the crayfish and prawn hemolymph upon cold exposure might address some the differences in the enhanced ability of the crayfish to withstand the slow acclimation to cold temperatures. Such susceptibility of the prawns to cold temperatures does pose an economic consideration for farmers in less temperate climates. The reproduction and survival of crustacean for aquaculture is of consideration [53,54]. In addition, the means of transporting live prawns would require extra care to control fluctuation in temperatures when a chilled environment might be considered feasible for other crustacean species such as for some species of crabs, lobsters and crayfish. In summary, prawns (M. rosenbergii) start to manifest a physiological compromised state with acute or slow changes in environmental temperature below 15˚C and are severely compromised with an acute change from 20˚C to 10˚C. Such inactivity in responsiveness of primary sensory neurons in prawns exposed to 10˚C accounts for the lack in behavioral responses of the intact animal to various stimuli. The hardiness of the crayfish (P. clarkii) to acute and chronic cold exposure in maintaining neural activity and HR relates to their ability to move away from a potentially threatening stimulus and physiological respond with alterations in HR and motor nerve activity. Funding was provided by Office of Undergraduate Studies (JG) for supplies and additional funding was provided with personal funds (RLC). Appreciation is given to Dr. and Ms. Graff, Lexington, KY, USA for editorial assistance. Nyström, P. (1999) Ecological impact of introduced and native crayfish on freshwater communities: European perspectives. In: Gherardi, F. and Holdich, D.M., Eds., Crayfish in Europe as Alien Species—How to Make the Best of a Bad Situation? Balkema, Rotterdam, 63-85. Ackefors, H. (1999) The positive effects of established crayfish introductions in Europe. In: Gherardi, F. and Holdich, D.M., Eds., Crayfish in Europe as Alien Species —How to Make the Best of a Bad Situation? Balkema, Rotterdam, 49-61. García-Arberas, L., Rallo, A. and Antón, A. (2009) The future of the indigenous freshwater crayfish Austropotamobius italicus in Basque Country streams: Is it possible to survive being an inconvenient species? Knowledge and Management of Aquatic Ecosystems, 19, 394-395. Krasne, F.B. and Winem J.J. (1975) Extrinsic modulation of crayfish escape behavior. Journal of Experimental Biology, 63, 433-450. Heitler, W.J. 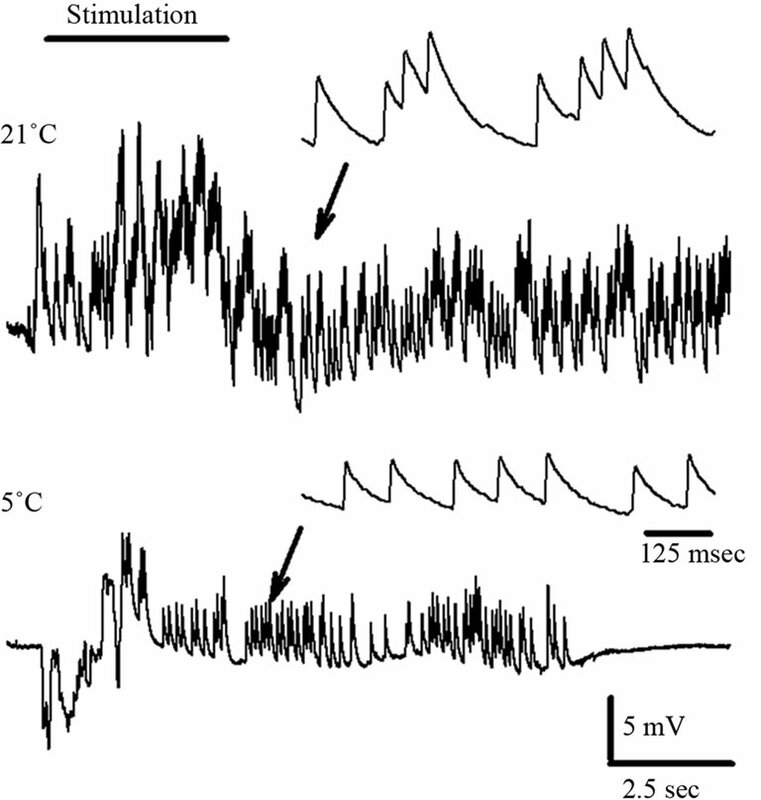 and Edwards, D.H. (1998) Effect of temperature on a voltage sensitive electrical synapse in crayfish. Journal of Experimental Biology, 201, 503-513. McRae, T. (1999) Chemical removal of nitrite and chlorinating agents from municipal water supplies used for crayfish and aquarium finfish culture. In: Keller, M., Oidtmann, B., Hoffmann, R. and Vogt, G., Ed., Freshwater Crayfish 12, International Association of Astacology, Augsburg, 727-732. Wilkens, J.L., Mercier, A.J. and Evans, J. (1985) Cardiac and ventilatory responses to stress and to neurohormonal modulators by the shore crab Carcinus maenas. Comparative Biochemistry and Physiology, 82, 337-343. Pagé, M.-P., Hailes, W. and Cooper, R.L. 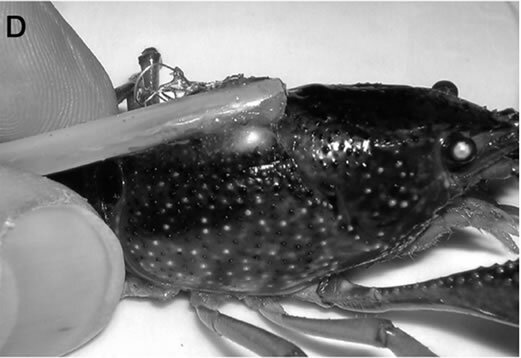 (2007) Modification of the tail flip escape response in crayfish by neuromodulation and behavioral state with and without descending CNS input. International Journal of Zoological Research, 3, 132-144.
Cooper, R.L. and Ruffner, M.E. (1998) Depression of synaptic efficacy at intermolt in crayfish neuromuscular junctions by 20-Hydroxyecdysone, a molting hormone. Journal of Neurophysiology, 79, 1931-1941. Strawn, J.R., Neckameyer, W.S. and Cooper, R.L. (2000) The effects of 5-HT on sensory neurons, CNS command, and neuromuscular junctions of the crayfish abdominal superficial flexor. Comparative Biochemistry and Physiology B, 127, 533-550. Schapker, H., Breithaupt, T., Shuranova, Z., Burmistrov, Y. and Cooper, R.L. (2002) Heart rate and ventilatory correlative measures in crayfish during environmental disturbances & social interactions. Comparative Biochemistry and Physiology A, 131, 397-407. Frederich, M. and Pörtner, H.O. (2000) Oxygen limitation of thermal tolerance defined by cardiac and ventilatory performance in spider crab, Maja squinado. American Journal of Physiology: Regulatory and Integrative Physiology, 279, R1531-R1538. Wine, J.J. and Krasne, F.B. (1982) The cellular organization of crayfish escape behavior. In: Sandeman, D.C. and Atwood, H.L., Eds., The Biology of Crustacea, Academic Press, New York, 241-292. Czajka, M.C. and Lee, R.E. (1990) A rapid cold-hardening response protecting against cold shock injury in Drosophila melanogaster. Journal of Experimental Biology, 148, 245-254. Desai-Shah, M. and Cooper, R.L. (2010) Actions of NCX, PMCA and SERCA on short-term facilitation and maintenance of transmission in nerve terminals. The Open Physiology Journal, 3, 37-50. Denlinger, D.L. and Lee, R.E. (1998) Physiology of cold sensitivity. In: Hallman, G.J. and Denlinger, D.L., Eds., Temperature Sensitivity in Insects and Application in Integrated Pest Management, Westview Press, Boulder, 55- 95. Nieminen, P., Paakkonen, T., Eerilä, H., Puukka, K., Riikonen, J., Lehto, V.P. and Mustonen, A.M. (2012) Freezing tolerance and low molecular weight cryoprotectants in an invasive parasitic fly, the deer ked (Lipoptena cervi). Journal of Experimental Zoology A: Ecological Genetic Physiology, 317, 1-8. Pruitt, N.L. 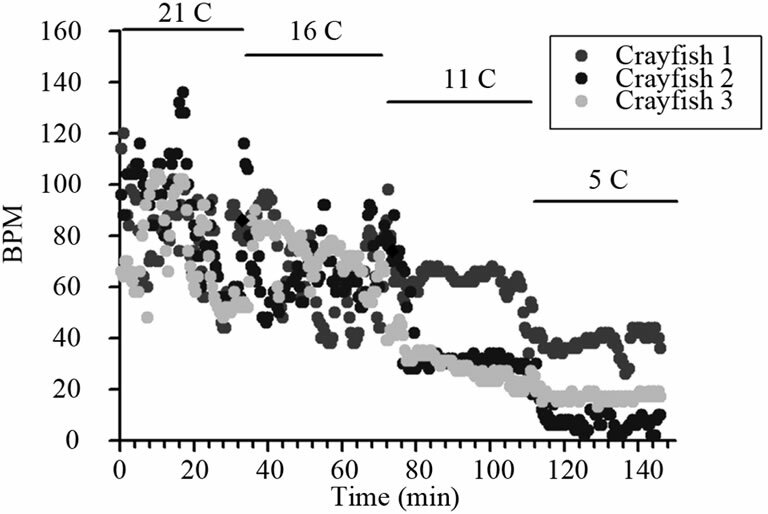 (1998) Membrane lipid composition and overwintering strategy in thermally acclimated crayfish. American Journal of Physiology, 254, R870-R876. Field, L.H. and Larimer, J.L. (1975) The cardioregulatory system of crayfish: The role of circumoesophageal interneurones. Journal of Experimental Biology, 62, 531- 543. Field, L.H. and Larimer, J.L. (1975) The cardioregulatory system of crayfish: Neuroanatomy and physiology. Journal of Experimental Biology, 62, 519-530. Wiersma, C.A.G. and Novitski, E. (1942) The mechanism of the nervous regulation of the crayfish heart. Journal of Experimental Biology, 19, 255-265. Van Harreveld, A. (1936) A physiological solution for freshwater crustaceans. Proceedings Society of Experimental Biology and Medicine, 34, 428-432.